I picked up the Serwex 362 from the now defunct NPIAB during its closing down sale. 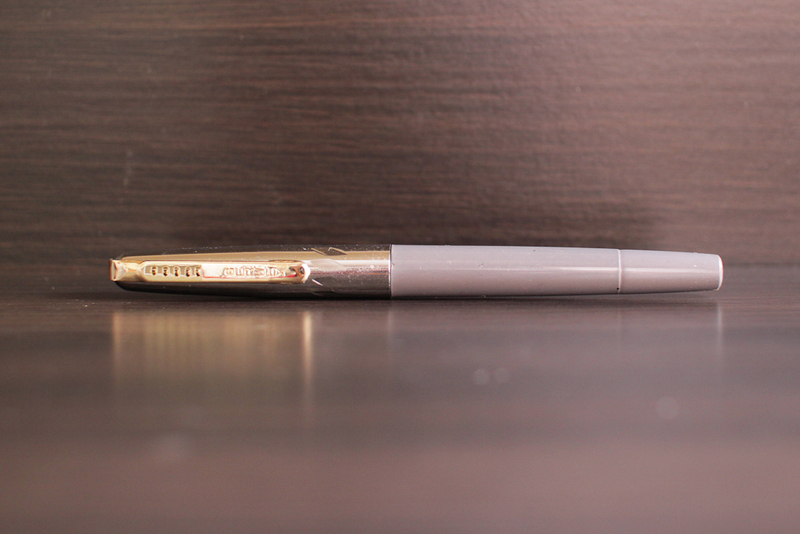 The Serwex 362 is an Indian fountain pen that you can find on various online stores. It is made via the injection moulding method. The Serwex 362 is very affordable but by no means the cheapest fountain pen that Serwex had to offer. I found Fountain Pen Revolution selling it at USD$8. From the various reviews I had found on Fountain Pen Network it is a pen that has its fair share of fans. However their experience with the Serwex 362 differs from mine. The cap is silver with a gold clip. It is made of metal but it doesn't add much weight to the pen. The cap is a screw on style and the threads are very tight so much so that uncapping the pen is a chore. As a result of the overly tight cap, I twist the clip out of place as I try to uncap the pen. The clip rocks a little in its place before I twisted it but having already done so it has worsen the clip's rocking. The clip is just a simple piece of metal bent to fit into a small slot at the top of the cap. It feels flimsy and fragile. I am afraid with my continual problems with the cap will cause me to break the clip off. The grip section is smooth and made of the same material as the rest of the pen. The threads are filed down so they don't bite my fingers when I write with it. The ink window is just below the threads on the barrell. It was designed to have a small arch-like shape all around the barrell. However the small arch-like shape are not uniform. Some have half the arch covered by the grey material that makes up the rest of the pen. I suspect this is due to the lack of quality control. 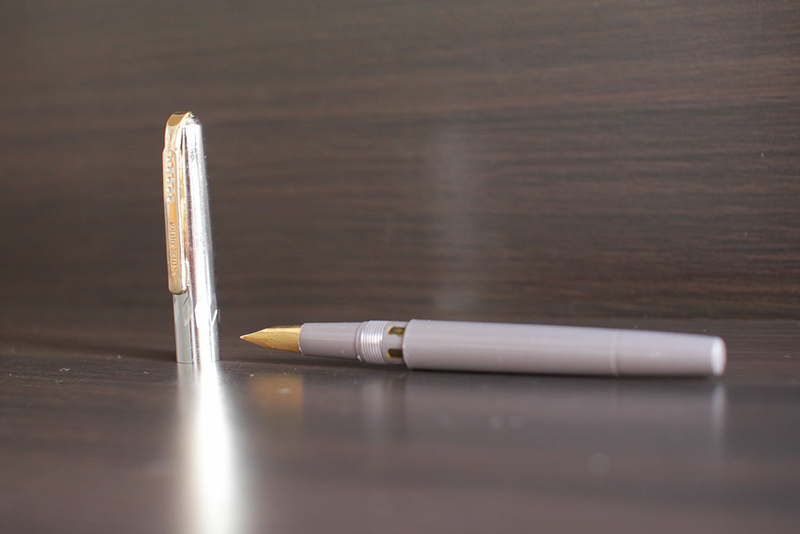 The Serwex 362 is a piston filling fountain pen. When it first arrived the piston was quite stiff but after filling it the first time, the piston isn't as stiff. I've opted for the grey fountain pen. It didn't arrive in pristine condition. There were small scratches all over the grey platic body of the pen. I am not sure if it was a fault of Serwex or a fault of NPIAB for the scratches. However scratches aside, the Serwex 362 is a serviceable fountain pen. The Serwex 362 is a light weight fountain pen. It balances well on my hand. I can use it without posting. However if you prefer to post your pens, the Serwex 362 is a push to post fountain pen. I found it rather back heavy once I posted the cap. When I ordered the pen I wasn't able to choose the nib size but I guess I got a M nib or a very very wet F nib. The line width is wider than I would normally go for. The nib is a very wet writer. I think it was my nightmare considering my lefty issues. However that said, it is a very very smooth writer. 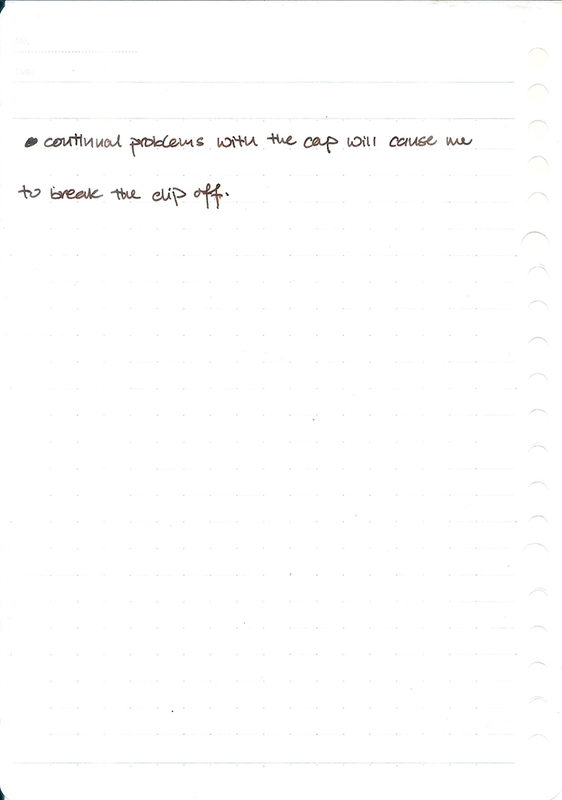 The nib glides easily across the page without any hint of feedback. The nib is hard a a nail so I can't squeeze any line variation out of it. I normally transport my pens to and fro my office inside my Nock Co Lookout which resides inside my Timbuk2 messager bag. I ride a motorbike to work so this bag goes into my motorcycle box. Most of my pens are able to be transport in this manner without any ink spillage. However the Serwex 362 suffers from some of the most major ink spillage I have seen. This pen has now been put on the strictly no transportation list. The only other pen that has similar problems is the Parker 51. Yes, I have plently of gripes about the Serwex 362 but to put everything into perspective, this is a very very affordable piston filler pen. The Super Rotax that I have reviewed previously gave me a better experience. It might be getting a lemon given the fans that the Serwex 362 has. In any case, it is a cheap pen to buy and try. If it doesn't work for you, you haven't lost much.